Savvy hotel owners routinely review their investment properties with Real Estate professionals to determine whether their holdings fit their long range investment needs. Our experienced team is pleased to offer you a strategic analysis and consultation. Premier Hotels and Motels experienced staff provides professional, thorough service to our clients. As trusted Realtors we are focused on the selling of hotel and motel properties, we are involved in the process from its outset to its conclusion. Pricing - Our staff is keenly aware of the latest trends in values for hotel properties. Using this market knowledge and experience, Premier Hotels and Motels can assist in pricing your property to maximize buyer interest, giving you the best value for your investment. Marketing - Premier Hotels and Motels tailors its marketing programs to meet the unique needs of each property and owner. Our marketing efforts -packaging, trade magazines, and the Internet- are designed to stimulate buyer interest in your property 24 hours a day. Communications - One of our strengths is the frequency of communication we maintain with our clients monthly newsletter. At minimum our associates speak with our sellers on a by- weekly basis. We provide customers where appropriate, marketing reports for our sellers. This communication leads to a more knowledgeable, prepared seller. Negotiating - Premier Hotels and Motels is highly experienced in the intricacies of negotiating hotel and motel transactions. We assist our clients and their professional advisors in arriving at pricing, terms and, most importantly, contract details that lead to a successful closing for all parties. Closing the Sale - Once a contract is signed, the work has just begun. 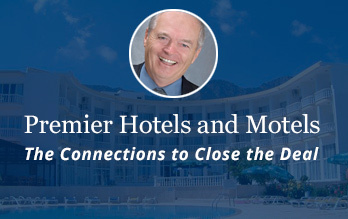 Premier Hotels and Motels works with the seller and buyer to facilitate due diligence review, franchise transfer, financing activities and the myriad of details involved in the successful closing of the sale of a hotel property. It is this attention to detail that separates Premier Hotels and Motels from its competitors.